The new Candy Bar from FXI turns your tv into a full-blown computer. This advance takes home and work computing to a new level. So, you own a number of ‘smart’ devices – phones, tablets, laptops, etc. Remember how you would constantly get irritated by how you wanted to use a particular file from your laptop on your smartphone but couldn’t without CONNECTING your phone to the laptop and transferring the file manually – tedious! Then came ‘dropbox’ which synced all your data wirelessly and all the files were available for you on all your devices. But what if you wanted to see a presentation on your HDTV? Dropbox sure isn’t available for your TV, and that’s where Candy Bar comes in. FXI, a tech company based in Norway has come up with a full blown computing device on a USB HDMI stick called the Candy Bar. You connect the stick to your laptop via USB, transfer files or presentations over to the device, and voila! You can now view them on your TV by connecting the stick via HDMI. The TV functions as a computer and you can remotely operate the Candy Bar via Bluetooth. The FXI Candy Bar is also equipped with micro-USB and is compatible with most devices ranging from Macs and Windows to Android 4.0 and Ubuntu. The company explains that the device will be on the market soon and that it has already started shipping to pre-orders from Norway. The device is said to be priced around $199 and is expected in the US by the end of May. 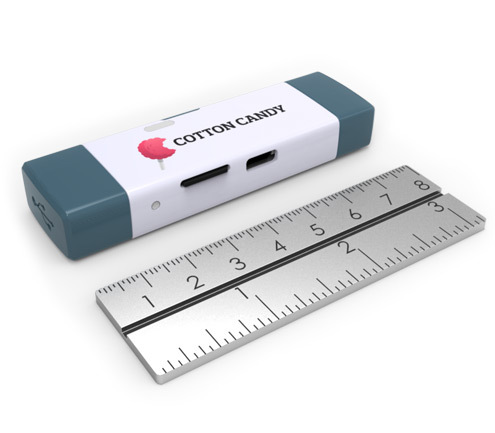 This entry was posted in Articles, FXI Cotton Candy, USB Stick, USB Technology and tagged Candy Bar USB Stick, Cotton Candy, FXI Candy Bar, FXI Cotton Candy USB HDMI Stick, USB HDMI stick, USB technology. Bookmark the permalink.